Empaths must be discerning about any medications they take. Since many new empaths are experiencing chronic sensory overload, anxiety or depression, conventional physicians often send them to psychiatrists for medication. Many physicians go straight to antidepressants and anti-anxiety medications when treating empaths, but I try not to use them initially with such sensitive souls. Sometimes, my patients just need to be kinder to themselves and make small adjustments which make their lives easier. For instance, Jane came to me experiencing intense anxiety when driving the Los Angeles freeways. The multiple lanes of cars and huge trucks whizzing by in both directions overwhelmed her and made her light-headed. Some empaths, including myself, have this aversion to freeways. The massive amount of traffic going at high speeds, and erratic, upset drivers are just too much stimulation for some of us to process. I haven’t driven the freeways for years! Although Jane had practiced deep breathing exercises before getting in the car, and took shorter freeway trips to get used to driving, these strategies were insufficient. Her physician had suggested anti-anxiety meds, but she wasn’t comfortable taking them. I presented Jane with a simple alternative. Instead of continuing to make herself crazy trying to “get over” her driving anxiety, she could give herself permission to avoid freeways when possible and take some wonderful side streets across the city, as I do. Jane felt tremendous relief with this solution. She simply allowed for more travel time to her meetings. I also urged Jane to stop pressuring herself to “be like other people,” a mistake many sensitive people make. You often have special needs that must be respected–and these needs are okay. You’re not failing or copping out by finding ways to be kind to yourself. The softer, easier solution to a problem can be a merciful way for you to resolve anxiety without having to turn to medication. However, if empaths have been chronically depleted by trauma or stress, they may require medication for depression and anxiety to re-balance their biochemistry. I prescribe these mainly for the short term. Interestingly, I’ve observed that many empaths require a much lower dose than other people to get a positive effect. For instance, a sliver of an antidepressant can work wonders for my highly sensitive patients. A mainstream physician might write this off as a “placebo response.” I disagree. Empaths are just more sensitive to everything, including medications. We often can’t tolerate the usual doses that conventional medicine deems effective. If you’re an empath who needs medication, I suggest working with an integrative healthcare practitioner who understands subtle energy so you can find the best dosage for your body. 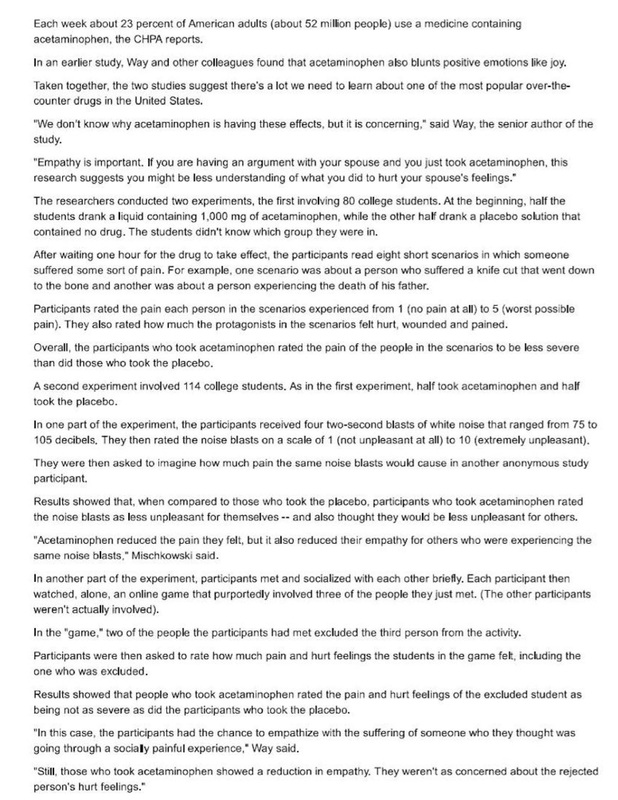 In addition, I’m also fascinated by new research about how pain medications can inhibit empathy. 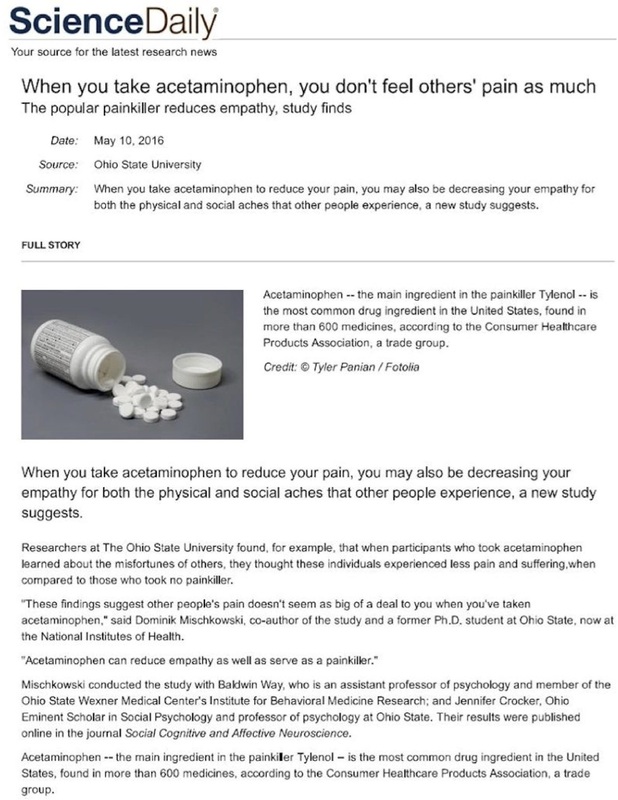 Ohio State University researchers recently found that when participants who took Tylenol (Acetaminophen) learned about the mishaps of others, they experienced less dismay than those who didn’t get the drug. So, if you have a conflict with a family member and you had just taken Tylenol, this research suggests that you might be less compassionate. Knowing that Tylenol decreases empathy is important since 52 million Americans take a substance containing it every week! Empaths need to use medications discerningly. Try to find an integrative health care practitioner and be sure to share how your body responds to the dose of medication you are given so you can regulate it if necessary. Most important, speak up if you are uncomfortable. Remember, the point of taking any medication or taking part in any therapeutic intervention is to focus on your healing!